and research center in Wisconsin! Noted fur trader Jacques Vieau established his second trading post along the west shoreline of Lake Michigan, near what would become in 1844 the Village of Mishicot. In 1795, Vieau became the first white man to settle Manitowoc County. A monument to this event was erected on Jambo Creek Road in 1922. Originally an Indian trail, Jambo Creek Road was named based on the Indian interpretation of Jacques Vieau. The Mishicot Historical Museum and Research Center is proud to host an extensive display on the life of Jacques Vieau. Jacques Vieau and his wife, Angeline. The unveiling of the Jacques Vieau monument. also a prestigious Wisconsin Registered Landmark. 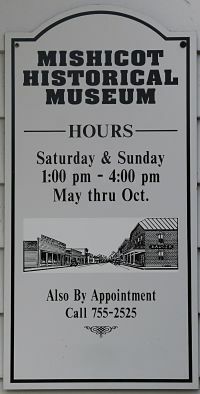 The Mishicot Historical Museum and Research Center is managed by the Mishicot Area Growth & Improvement Committee Inc. ("M.A.G.I.C"). The mission of M.A.G.I.C. is to preserve and promote the unique history and heritage of the Village of Mishicot and surrounding areas and to aid in the their preservation by identifying, recording , managing and providing access to this information. June-August, 3:00 to 6:00 p.m. The museum is also available by appointment and for group tours. Contact the Mishicot Village Hall at (920) 755-2525, or Museum Committee Chairman Jim Sustman at (920) 755-3317 to schedule. © 2017 Mishicot Historical Museum and Research Center. Blogger website by Melinda 920-403-0898. Picture Window theme. Powered by Blogger.